The birds are back. The patch we put over their hole only temporarily thwarted their attempts at building a nest in the side of our house. They have begun to peck around the patch in search for a spot just as easy to penetrate as the original location. Take your pick birds, the siding is in serious need of replacement. At first, I was pretty miffed. There’s a product called Bitter Apple they make for dogs that you can spray onto things the dog is chewing, such as furniture, to deter them from using the item as a toy. I wondered if they made anything like that for birds that you could buy by the gallon, attach to your hose and spray all over your house. However, every dog we’ve ever had has merely licked off the Bitter Apple and continued to gnaw on whatever it was we sprayed (for one dog, this was the kitchen table, cabinet corners, baseboards on the wall…). With my luck, I’d have the same result with the birds. But, after staring at the chips in the siding for a while, I had to admit that I admired their tenacity. If I was able to look past the frustration caused by damage being done to my house, perhaps I could learn something from these persistent creatures. If this were a fable, the moral would be: never let anything stand in the way of accomplishing your goal. 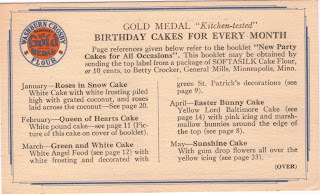 I have learned so many things from this recipe box: how to separate eggs, how to make a boiled icing, that a doll can be used to decorate a cake, and that, with enough cream cheese and sugar, cranberries can actually be really sweet. But perhaps the greatest lessons I’ve learned haven’t come from the recipes themselves, but from the posts I’ve written about them. Before this project, I’d cook dinner or bake cookies and never consider the process or how it relates to other aspects of my life. Now, every time I step out of my kitchen, I take the experiences from that room along with me on every journey on which I embark. Life is like reading a recipe card; you have to pay attention to what you’re doing or you might miss something very important. Kate DiCamillo, author of Because of Winn-Dixie and The Magician’s Elephant (if you haven’t read this one, I highly recommend it – it’s a beautiful story that will reignite your ability to believe in the impossible) has a beautiful essay on her website that illustrates this point perfectly. She describes an experience of walking out of a grocery store and how the events that followed were her inspiration for writing Because of Winn-Dixie. However, it was the words of a writing teacher that caused her to recognize the importance of paying attention to moments like those. Because when we do, we bear witness to simple acts that can change us in profound ways. There are magical moments surrounding us all the time, but if we ignore them, we deny them the chance to change our lives. As I chose my next recipe, I was given an opportunity to not only apply what I learned from reading Kate DiCamillo’s essay, but also the lessons gathered from watching the birds dismantle my siding one peck at a time. 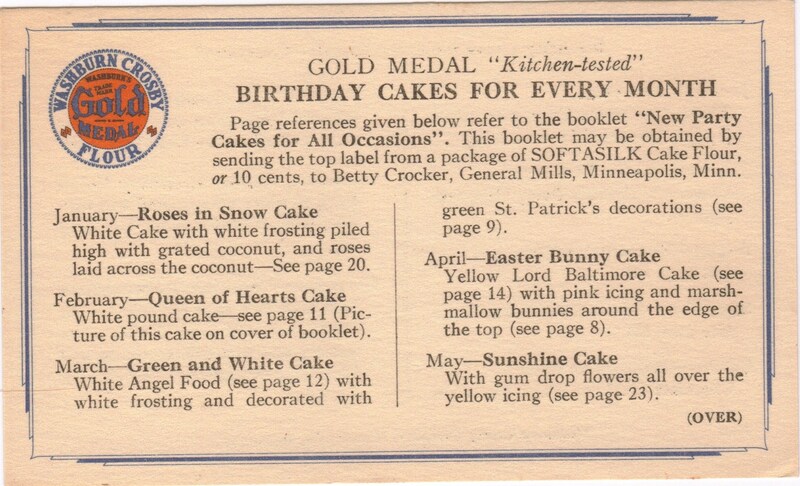 I pulled out the Birthday Cake for Every Month recipe card and saw the cake for April was an Easter Bunny Cake. I could have kicked myself for not checking sooner because I missed being able to post it for the Easter holiday. But when I checked the booklet to find the recipe, it wasn’t there. 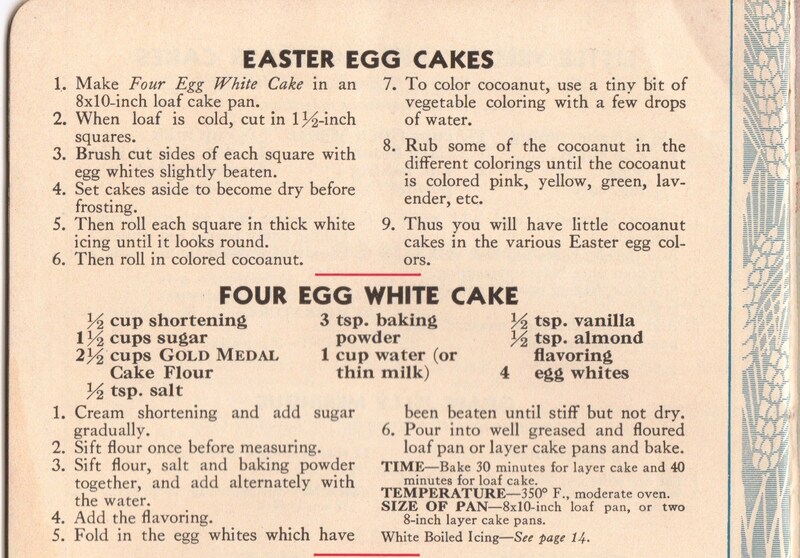 Instead, there was a variation on the Four Egg White Cake called Easter Egg Cakes. Eggs actually sounded a lot easier to make than a bunny and, after a marathon week of baking the previous week, I was happy to accept the lesser of the two challenges. The cake itself is fairly simple and is baked in a loaf pan. While it was in the oven, I moved onto the next step – frosting and decoration. The frosting in the booklet is another boiled icing. As I’ve stated before, I finally figured out how to make them successfully, but don’t like the taste so I’ve been attempting to learn how to make other frostings to use as an alternative to the boiled icing. This week I made a Butter Cream Frosting (I found a recipe online, click here to view it). The decoration stage added a new skill to my culinary repertoire: dyeing coconut with food coloring. This may not seem very exotic, but for some reason, I was excited to tint the coconut shavings with bright spring colors. It’s simple really. Drop a few drops of food coloring into a bowl. Add in just enough water to dilute the drops to the desired color and to produce enough liquid to cover the coconut. Then add the coconut shavings and stir. It’s that easy! Once the cake is cooled, cut it into pieces and frost each piece separately on its side so that it resembles an Easter egg (I had to make two batches of frosting to cover all the pieces of cake). 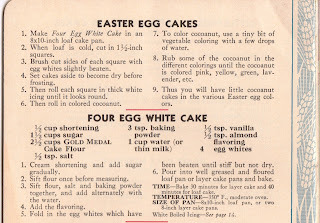 Then cover each “egg” with the desired color of coconut. Soon you’ll have a table full of fuzzy little cakes in an array of beautiful colors. Looking at the cakes covering my kitchen table, I thought of the birds and their quest to find a place to lay their own eggs. Part of me felt bad about taking away the location of their dream home. But when I took a break from cleaning the dyed-coconut kitchen counters and walked into the backyard with Murphy, I was treated to a beautiful sight. The birds had found a new home! I have three birdhouses in my yard, none of which have had the privilege of hosting a family for the spring and summer…until this year. Two of the three homes are happily occupied (hopefully the family that tried to set up camp in my siding has taken residence in one of these houses). Watching the birds flit around my yard carrying twigs and bunches of dog hair to build their nests, I realized that it isn’t persistence alone that leads to success, but you also need to be flexible and resilient as well. I considered all the resumés I’ve sent out in the past year that have been rejected, ignored, or lost among the endless piles. Maybe this block I’ve come up against is no different than the patch we put on our house to cover the birds’ hole. Maybe life is telling me that if I keep my eyes open and pay attention to what’s around me, I’ll find a beautiful, spacious birdhouse of my own. And it’s a reminder to dream big. Because what the birds thought was perfect – a hole pecked into the side of a house – was actually meager in comparison to the luxurious home in which they now reside. Murphy and I decided to present a housewarming gift to the birds: more dog hair. I got the brush and with each stroke, I gave my dog some much needed grooming and produced even more snuggly bedding for the birds and their babies. Once the bristles were overflowing with golden strands, I emptied the brush into the tangle of leafless bushes where the birds could easily find our gift. Everyone’s dream needs a helping hand and I was happy to lend one to the birds. It was the least I could do to repay them for all they had done for me. Sure, they pecked a hole in my house, but that hole led me on a journey to discover that I need to keep my eyes open because I just might find that I’m closer to realizing my dreams than I thought. For Kate DiCamillo, opening her eyes made her realize that walking out of a grocery store can lead to more than an afternoon of unloading groceries. For me, opening my eyes taught me that cooking is more than mixing ingredients or learning to dye coconut, it’s about the stories attached to the cards. As I pull each batter-stained recipe out of the box, I imagine the stories dripping like melted butter off the tattered paper and onto my kitchen counter. With a quick swipe of the sponge, I’ll wipe them all up and wring them out onto a page where, hopefully, they’ll spread their magic and inspire others to pay attention to the world around them. You never know when you might encounter the simple moment that may change your life in unimaginable ways. Will your eyes be open to receive it?